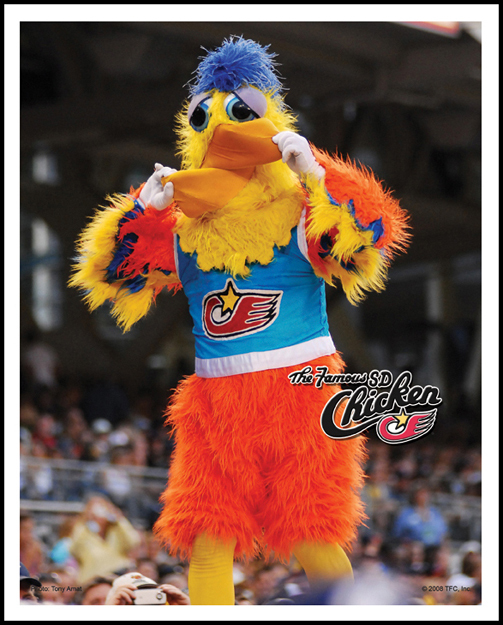 The classic 8x10 color glossy is here in a variety of fun styles. 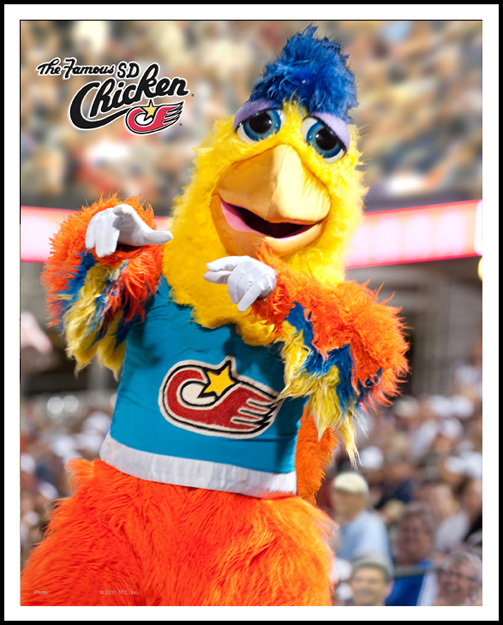 Suitable for framing and made of top quality print stock, The Chicken himself (honestly) will personally sign them at your request. Buy as many as you like for just $4 each. No kidding, only $4 and we pay for all the postage. 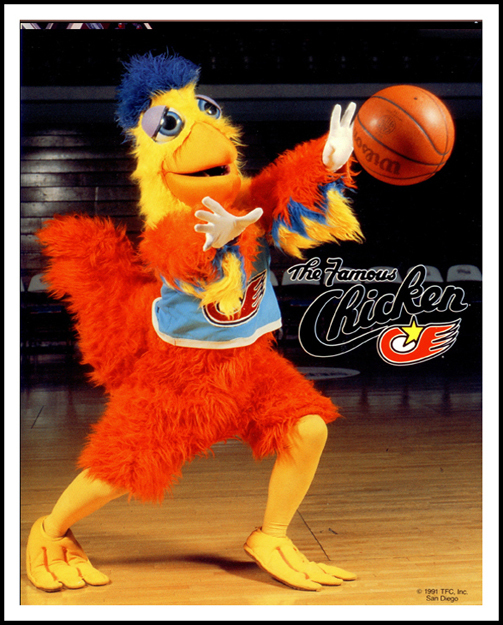 If you want special wording with The Chicken's autograph, just add it to the box. 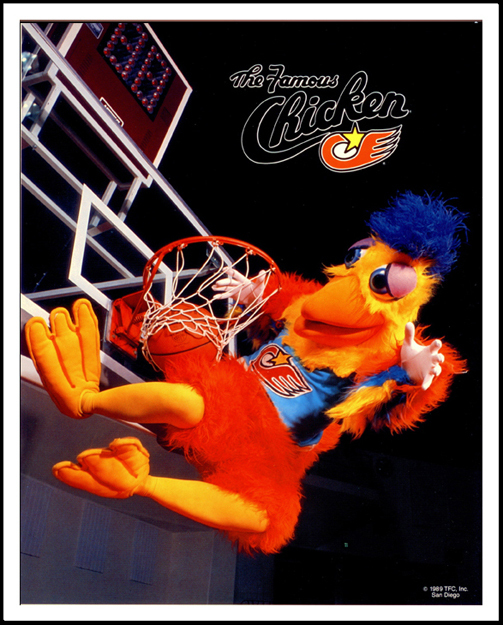 The Chicken (played by Ted Giannoulas) is happy to include his real name as an added signature option. Please make the selection of your choice for each photo. All prices for US orders. International orders subject to additional shipping charge. 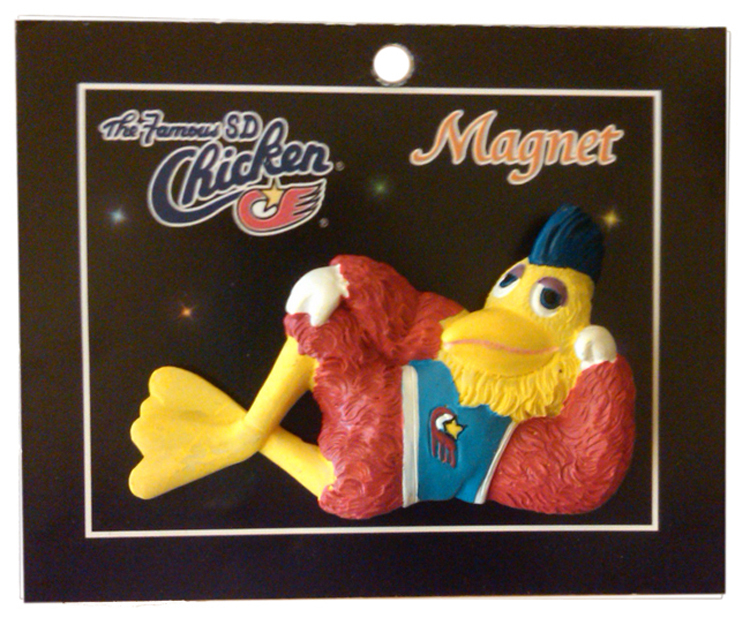 Signature Options : No signature Sign as "The Chicken" Sign as "Ted Giannoulas" Sign both "Chicken" and "Ted Giannoulas"
We are pleased to introduce the brand new San Diego Chicken Magnets! These darling pieces come in full color and are 3D. 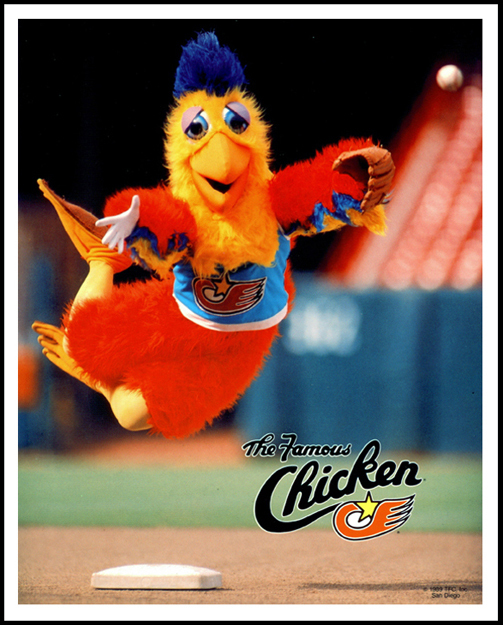 The Diving Pose Magnet is based on the 8x10 photo above of The Chicken diving into 3rd base while the Laying Down Pose is based off an old school picture of The Chicken when he was impersonating a famous photograph of Burt Reynolds. 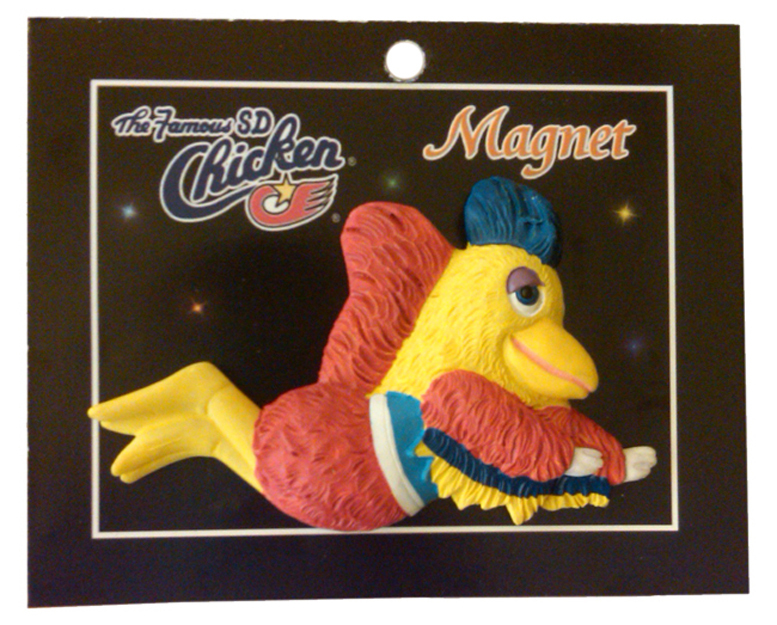 These charming magnets make a perfect addition for any refrigerator, microwave, oven, locker, or chalk board. Made from durable polyresin material like our bobblehead doll and strong enough to hold up an 8x10 glossy, it is sure to be a real eye catcher. These magnets measure 3x2 inches and come in some handsome packaging. Collect them before they become extinct! All prices for US orders. International orders subject to additional shipping charge. 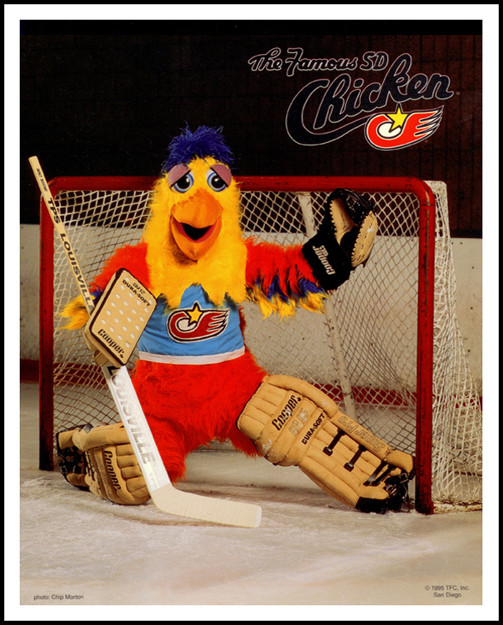 Compile a collection of autographs from your favorite athletes with The Famous Chicken autograph book. This book is hard bound with plenty of pages to capture celebrity signatures. 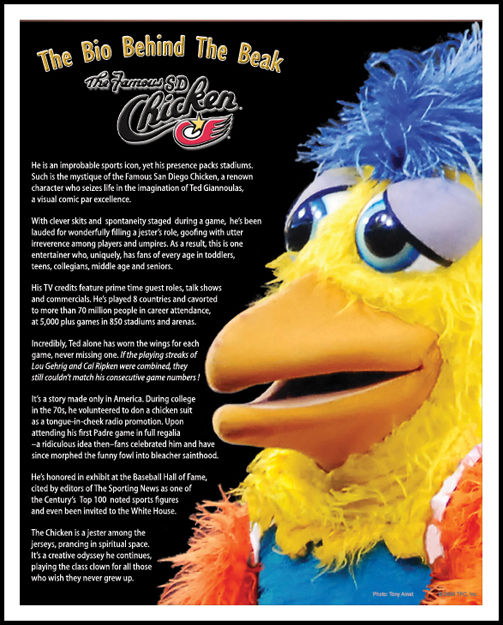 The front and back cover both feature a color picture of The Chicken. The size of the book is 5.5” x 4”. 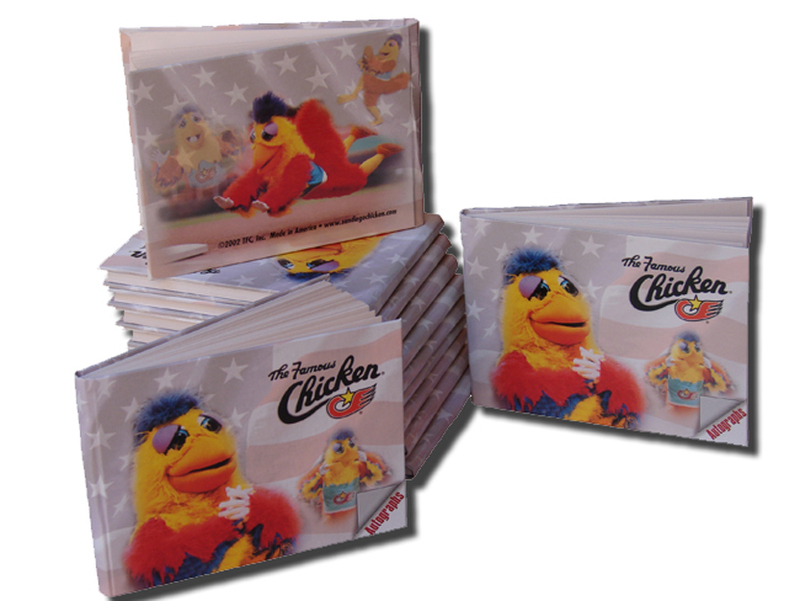 It can also serve as a daily diary or journal, notepad, or coloring book for the kids. International orders subject to additional shipping charge. 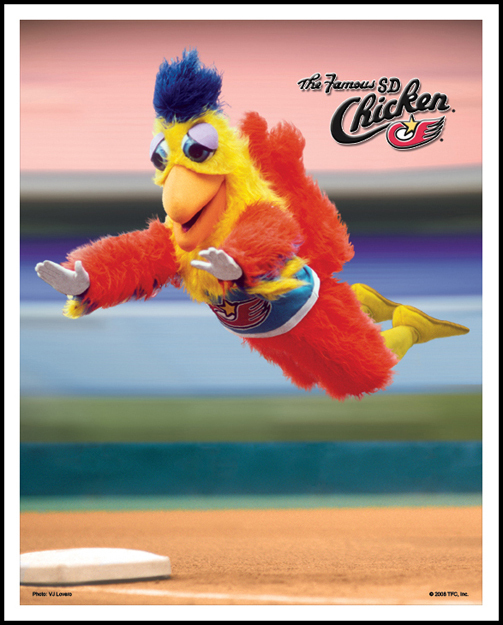 Dress up your room with this San Diego Chicken wall poster. 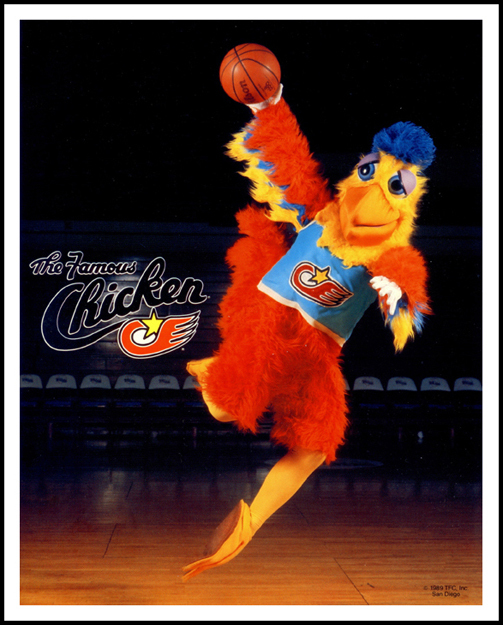 It measures 18” x 25” and is on cover stock paper with Aqueous coating and printed with the latest in Stochastic technology for a colorful, clear and crisp image. 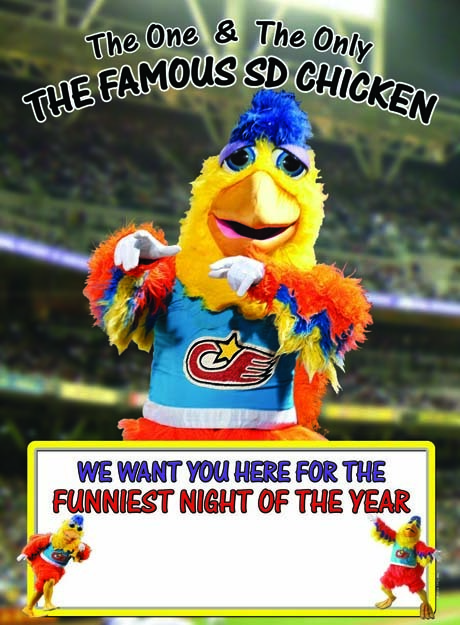 The Chicken will sign the poster at no additional charge. The price of the poster is only $8 and that includes shipping. This is a limited time item so order now!